As most of you may have encountered this problem that Windows 10 is no longer able to play Blu-ray disc directly, which is supported on Windows 7, users are deeply disappointed at this change. Never mind, there is always a way out to solve the problem. The most direct and easiest way is to enable Windows 10 to play Blu-ray on VLC. Naturally, if you are a green hand, you may ask how to use VLC to play Blu-ray on Windows 10. Read on and this guide will tell what you need in details and finally give you more alternatives to play Blu-ray on Windows 10. 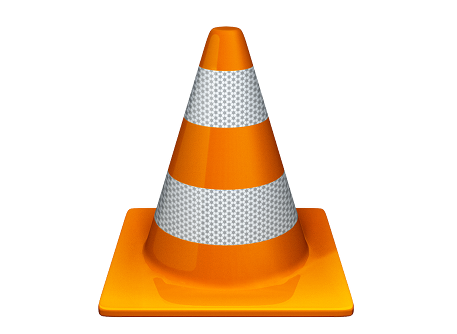 With a logo looking like a Halloween hat, VLC player is way more powerful than a hat. It was developed by a non-profit organization VideoLAN Project and publicly released in 2001. VLC features an open-source application that gives you the ability to play media from your computer or a disk, or to stream it from the Web. Both desktop operating systems and mobile platforms are supported. It claims the ability to play most multimedia files as well as DVD, Audio CD, VCD, and various streaming protocols. It is one of the most frequently used media players in the world and continues to see increasing popularity worldwide. Many users choose to use VLC to play Blu-ray on Windows 10 mainly because by adding AACS and BD+ DRM libraries and keys, VLC can play most of Blu-ray movies. VLC is a powerful open source media server that is capable of handling all kinds of media files, including but not limited to Raw DV, MXF, VOB, RM, Blu-ray, DVD-Video, VCD, SVCD, CD Audio, DVB, HEIF, AVIF. VLC has become a must for Windows 10 users who don’t have much experience handling complicated programs. It is upsetting that there is not any Blu-ray playback support with Windows 10 but VLC can be a solution to this problem. That is the major reason why so many users turn to VLC and enjoy their Blu-ray movies with home-theater like experience. However, as what I have told in the beginning, it does not mean that bare VLC can play Blu-ray movies immediately and all you need to do is download and place the AACS and BD+ DRM libraries and keys in order to play Blu-ray on Windows 10 with VLC. You are almost there to play Blu-ray movies if you can kindly follow the steps in below section to make sure your VLC is correctly configured with the necessary AACS and BD+ DRM libraries. Let’s roll it out. The most popular way to make VLC compatible with Blu-ray movies is to download and drop the AACS and BD+ DRM libraries and keys to the app data of VLC. Here I will list the detailed steps below for your reference. However, if you are not keen on doing this, I also have another recommendation for you to play Blu-ray on Windows 10 with VLC, which is to rip and convert Blu-ray to VLC compatible format. As you may be aware, VLC is not naturally configured with AACS and BD+ DRM libraries and keys by default due to legal reasons. That can be done manually with the following steps in order to play Blu-ray with VLC on Windows 10. Step 1: Download and put keys database in place. Download the keys database and put it under the folder with the route like C:\Users\MY_USERNAME\AppData\Roaming\aacs. If you don’t have an aacs folder, create one manually. Step 2: Open your user area and enable hidden folders. Enable view hidden files and folders by clicking Organize > Folder and Search Options > View and select to show hidden files. Step 3: Open the AppData directory. Create a folder and name it aacs. If you have got one already, simply put the KEYDB.cfg file in this folder directly from the unzipped Blu-ray playback addon pack. Step 4: Download and place AACS dynamic library. For Windows 8 32bit, Windows 10 32bit, free download the 32bit AACS dynamic library. Then put the file in your VLC directory. For Windows 8 64bit, Windows 10 64bit, free download the 64 bit AACS dynamic library. Then put the file in your VLC directory. Step 5: Open Computer > Local Disk (C:) > Program Files. Navigate to the VLC directory and move appropriate file from unzipped Blu-ray playback addon pack to this directory (file located in “aacs/windows 32” or “aacs/windows 64” directory in pack). After completing these 5 steps, you are able to play Blu-ray on Windows 10 with VLC directly. This is a one-stop solution and you can freely enjoy Blu-ray movies using VLC from now on. Some of you may feel confused about the above steps especially for novice, who may want a more direct method to play Blu-ray on Windows 10 with VLC. Then you should not miss this part. 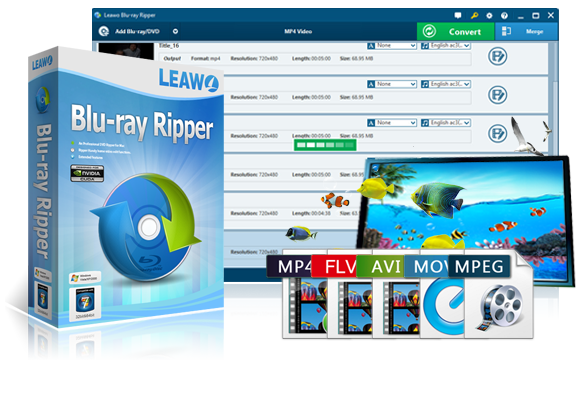 Leawo Blu-ray Ripper is a program that helps users rip and convert Blu-ray to all kinds of formats available on players such as VLC, windows media player, and so on. With this program, 100% original quality can be reserved and 6X faster speed is provided. What’s more, 180 plus formats ranging from common video/audio formats like MP4, MKV, AVI to specific devices like Apple TV, Surface 2 etc are supported. If you won’t bother to add anything to your VLC configuration, you should definitely try Leawo Blu-ray Ripper as it will save you so much time and efforts that you can enjoy home theater like experience on VLC as well. I will show a simple guideline here for your reference. ☉ Straightforward and easy-to-use interface. Step 1: Install Leawo Blu-ray Ripper. Click the button Above to download and install the program on your PC. Launch the program once installation completes. It’s packed in a software suite called Prof.Media. You can find the Blu-ray Ripper shortcut inside it. Step 2: Add source Blu-ray files here. Click Add Blu-ray/DVD to import the source files here. You have three options, namely Add from CD-ROM, Add from folder, and Add iso file. Choose the correct one on your own. Step 3: Choose ripping mode. Use the 3 buttons in the upper left area to select different videos in the disc to rip. Check Full Movie and it’ll select all the videos. Select Main Movie to rip the main movie. Use Custom Mode to select multiple videos from the list by yourself. Step 4: Change the output format. Click on the format drop-down menu and click Change to choose the target output format. 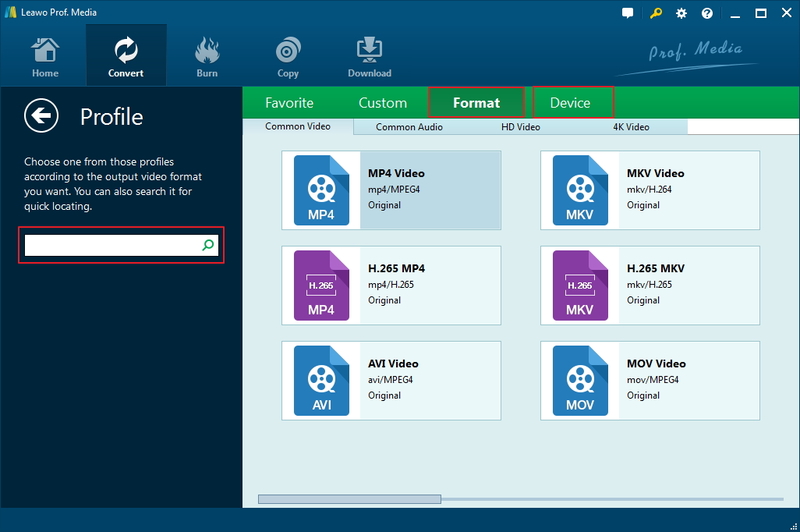 Normally we will choose the most common format MP4 as the output format. You can also go to Format>Lossless Video and select the Multi-track MKV profile to have the program convert Blu-ray to lossless MKV. Step 5: (optional) Edit the file before conversion. 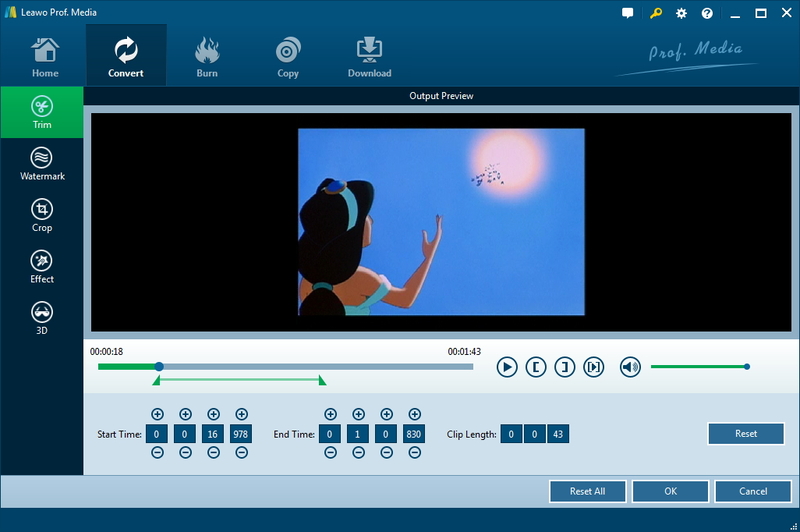 Click on the editing icon to edit the video such as trim, crop, add watermark to personalize the output effect or click Edit from the format drop-down menu to adjust parameters such as video codec, resolution, sample rate etc. Note that this is optional. Step 6: Convert Blu-ray to MP4. Once all settings are done, click the green button Convert on the toolbar and you will be asked to set a directory to save the output file. After that, click the button below to start converting Blu-ray to M4 finally. Here’s Leawo Blu-ray Ripper’s video guide for your reference. Now you can freely stream your Blu-ray on Windows 10 with VLC or any other media players. 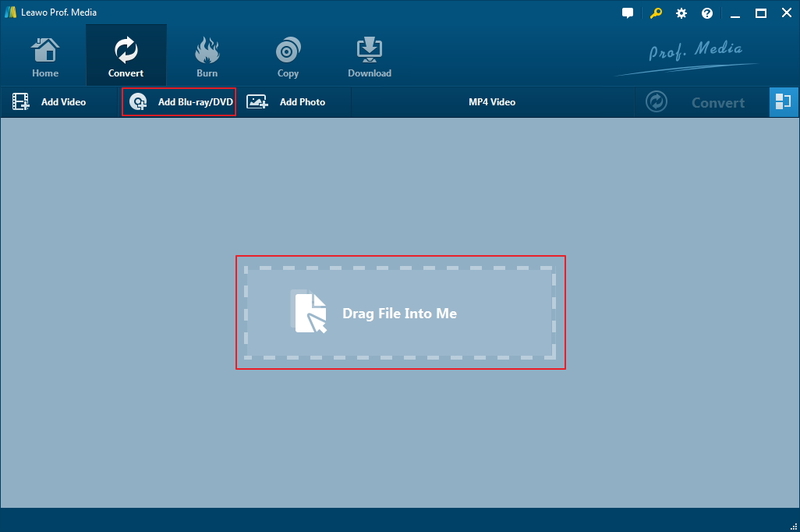 If you like watching movies on the go, choose MP4 to have the program convert Blu-ray to MP4 so that it can be played on most of your mobile devices. Better than doing addition or conversion to the VLC player or Blu-ray files, there is a simple way to settle the problem of playing Blu-ray on Windows 10. Yes you can use the player that can directly play Blu-ray to minimize your efforts. Here are a few alternatives to VLC players that can perfect your experience on watching Blu-ray directly on Windows 10. UFUSoft Blu-ray Player is absolutely one of the options. 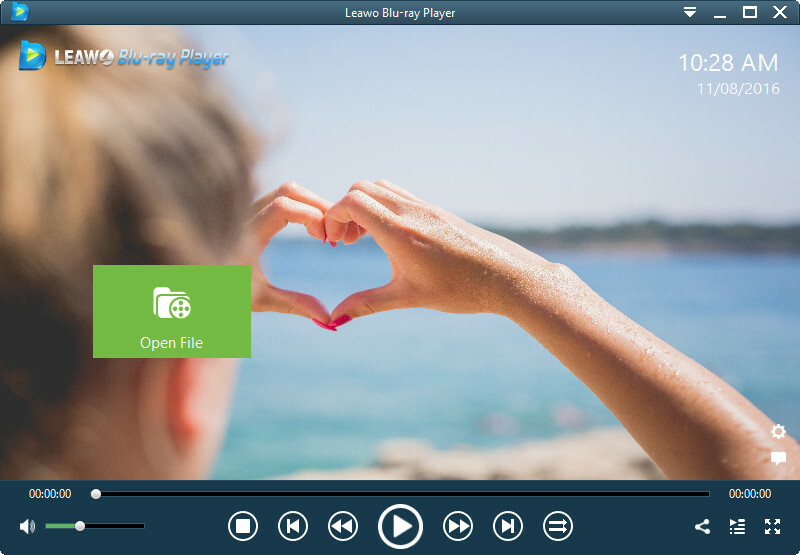 It is an easy-to-use Blu-ray player software that helps users enjoy any Blu-ray movie with excellent video and audio quality. It can handle 4k videos, HD videos, AVCHD videos,H265/MP4 AVC and so on. Users can maximize their experience by taking the advantage of its features. Anyway, it costs $32 a year or $45 lifetime to enjoy the convenience, efficiency, and quality of Blu-ray enjoyment on Windows 10 with this player. However, if you are running on a budget, I strongly suggest you use Leawo Blu-ray Player instead of any other paid players on the internet. Leawo Blu-ray Player is a 100% free program being developed to assist users in playing any Blu-ray disc, DVD folder, ISO file etc directly. It is capable of handling 4K video in MKV, MP4 and TS formats, 1080P videos in HD MP4, HD MKV, HD MOV, etc., 720P videos in MP4, AVI, MKV, and other formats. It prides itself on Blu-ray/DVD/4K HD video player in the world. More importantly, this program is extremely easy to use even for beginners. Just a recap of what we have described above, VLC is a good choice for users to stream Blu-ray on Windows 10 if users are capable of handling AACS and BD+ DRM libraries and keys. If users are not familiar with that operation, they can use Leawo Blu-ray Ripper to help settle the problem by ripping and converting the Blu-ray to a common video format, which will be playable on VLC without any trouble even if they do not have AACS or BD+ DRM libraries and keys put in place. In this way, users can freely enjoy Blu-ray on Windows 10 with VLC. The last but not least, two video players are introduced, which allow users to play Blu-ray on Windows 10 directly. One is a paid program and the other is totally free. 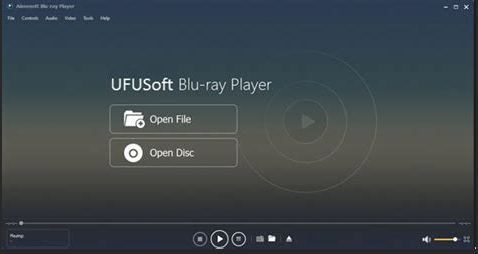 It is absolutely up to you to decide which solution to play Blu-ray on Windows 10, either UFUSoft Blu-ray player or Leawo Blu-ray player will be good and sufficient to help.